A group of people were having an exchange on the Catholic Creative’s Facebook feed surrounding the current state of the Catholic Church’s art patronage. The initial question posed was: "The Church used to be the greatest patron and supporter of art in the world, so what happened?" We were referring to “art” in a broad sense, meant to include architecture, film, and design, as well as fine arts such as painting and sculpture. Fr. Steve had made a few comments that we thought were worth some elaboration, so in this article we interview him to dive deeper into this conversation. We hope you enjoy it and find it helpful. If you are a part of the community, you can read that conversation here. Do you agree with the premise that the Church is no longer a leader in the arts? In comparison to previous epochs, my answer is yes. The Church’s influence on and patronage of the arts has diminished considerably. The reasons for this diminishment are complex and discerned through realities that are political, cultural, and economic. In terms of the political, the Church no longer possesses the territorial sovereignty or influence that it once did, the effect of which its access to monetary resources has dried up. In terms of culture, in the contemporary Western milieu, there has been a shift away from the narratives of Christian revelation as a source for artistic inspiration. The Christian narrative no longer provides the primary source of identity and the interpretation of the self and the world. Finally, there is the economic reality (which I alluded to in my reference to the political). Bereft of the monetary resources that came with territorial sovereignty and political influence, the Church no longer has the kinds of resources available to it that enabled its great artistic patronage in the past. Further, pious patrons willing to support artists on behalf of the Church have dwindled as the perception of social benefit of such patronage has also changed. Supporting the work of the Church in the past meant building up its architectural and artistic patrimony. But now, for the most part, patronage exclusively means supporting the Church’s charitable and institutional endeavors- education, health care, disaster relief, and concerns related to the alleviation of poverty. How would you explain the main difference between today’s system of art patronage and that patronage at the height of the Church’s influence? The Church has less money for the arts and therefore the primary patrons are not holders of ecclesiastical offices, like the pope, bishops or abbots, but instead these patrons are wealthy laity and some Catholic institutions (like a university or a hospital). The commissions that are offered often place art as an addendum to overarching values of functionality, practicality and cost efficiency. These values mean that the art that is commissioned often seems decorative rather than integral and if the Christian narrative is presented in these artistic representations, it often appears abstract or diluted, so as to conform to secular sensibilities. I have noticed that many examples of modern and contemporary art commissioned for Catholic universities and hospitals leave me with the impression that the Christian narrative influencing these commissions has worn thin or has been accommodated to secular interests. You mention Catholic universities and hospitals, what about parishes? The character of parishes as public institutions has diminished and has been replaced with an emphasis on the domestic, with its emphasis on fulfilling immediate need, group consensus, practicality, and budget. These values will not position the parish as a patron of creative artistic endeavors and certainly not produce art or architecture of broad cultural significance or lasting value. Further, as so much of the modern artistic sensibility places an emphasis on the abstract and subjective as a bearer of creative expression and meaning, it has a tendency to be uninspiring or off putting as devotional or liturgical pieces. Commissions of this kind in parish churches usually fall flat and fail to produce much affection in the faithful. In this regard, Blessed John Henry Newman’s distinction between real and notional assent comes to mind. So much of modern and contemporary art and architecture tends towards the notional. However, in my estimation, art and architecture that supports devotional and liturgical experience is reliant on the real assent in order for it to be efficacious. This difference, between notional and real assent, creates the cognitive dissonance so often characteristic of the experience of modern forms and styles in church art and architecture. This is what I believe generates at times a reactionary mindset toward what is perceived to be novelty in religious art and fosters a retreat into kitsch. Unfortunately, this also means that modern or contemporary art is pilloried or caricatured as incapable of being a bearer of religious experience or theological meaning, when it is actually capable of profundity at a different level of religious experience- the subjective or the notional. What many fail to appreciate about modern art is that it can be the bearer of a different kind of religious longing or perception. An example would be certain forms and styles of contemporary art that seeks to evoke ordinary experience, rather than limiting the devotional or liturgical, as a legitimate bearer of religious meaning. 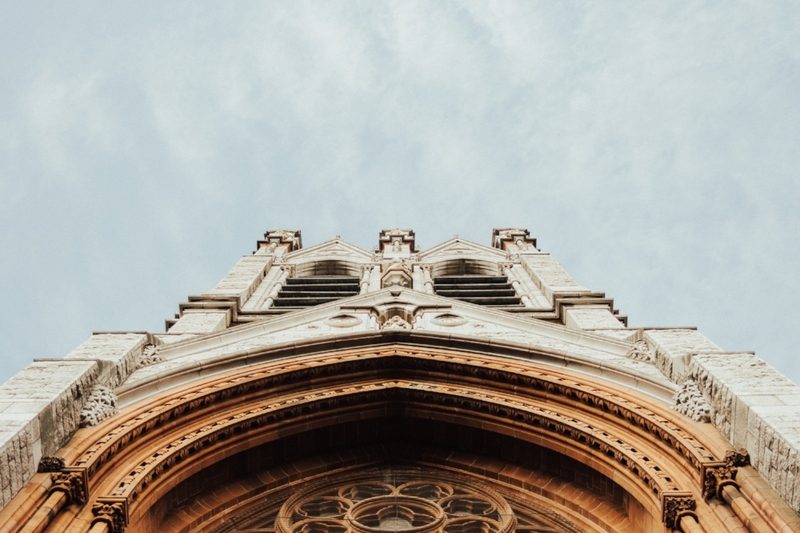 This might provoke a reaction in some believers as it seems to displace the privileged place the devotional and liturgical can legitimately claim in the life of faith. However, this reaction seems at times overstated and just too much as ordinary experience and subjective experience are legitimate bearers of Christian truth claims and routes of access to transcendent meaning and purpose. I get the necessity of privileging real assent in terms of the Church’s liturgical and devotional rites, but there must be room for more than this in terms of the Church’s creative engagement with the arts. Why? Because real assent is not simply about how Christians experience devotional or liturgical realities, but how the Christian understands, and therefore accepts, common, everyday experience as being, in the words of Gerard Manley Hopkins, “charged with the grandeur of God”. And further, notional assent can direct direct our minds and hearts towards God in a different way, complementing real assent, and at times, purifying its intentions. Can you elaborate a bit on the role of the arts in society at large and how it has changed in relation to a time when the Church had more influence and resources on the arts and artistic patronage? Pressed, I would answer this question as what we see now is a diminishment of the Christian narrative regarding the meaning of the world and in terms of its cultural priority and significance. I believe that the prioritized narrative of Western culture is now best summed up in Justice Kennedy’s articulation of his reasoning in the “Casey vs. Planned Parenthood” decision- the right of individuals to decide for themselves not only the meaning and purpose of their own lives, but of the universe itself. This is, of course, absurd, but it is the prevalent cultural narrative and it is a narrative that positions the Christian narrative, indeed all other narratives that propose a meaning and purpose to life and the world. I identify this narrative as the secular narrative. The prevalence of the secular narrative that insists that meaning and purpose is individually constructed has been a driver of artistic expression for some time- artists often serve this narrative because it is the only narrative they know or because they truly believe in it, as artists once served the Christian narrative because it was the only narrative they knew or believed in. The other characteristic difference is a sensibility that all the great Christian artistic and architectural forms and styles have already happened and the purpose of the Church has become custodial of these past forms, dedicating what resources it has to conservation, rather than creation. There seems at times an inability to appreciate that forms and styles like the Gothic, or the Baroque, were in the context of their own time groundbreaking and new, a departure from past forms and styles. A conservationist attitude is helpful inasmuch as it can preserve what is truly significant for the future, but when it results in a reactionary disposition that refuses to accept difference or the new simply because what is different or new can represent a departure from the familiar, Christian artistic expression will inevitably become kitsch and decline in its significance. You mentioned cinema as the premiere media form of our time. Why cinema and not architecture, art, theater painting and sculpture? What does the Church need to realize about cinema that it doesn’t seem to get? All art and architecture represents visual storytelling. But it is my impression that the most significant form of visual storytelling in contemporary culture is screen based, cinema, television. This kind of visual storytelling has the broadest reach and the deepest cultural resonance. For the most part, I believe that only cultural elites know who the architects, painters and sculptors are and the forms of theater than capture of culture’s attention do so because they imitate the spectacle and narratives of cinematic production. However, more than the elites know the creative artists of cinema and television. The Church realized early on the impact of film and television, but lacking the ability to produce quality examples, it sought to leverage its cultural influence as a moral authority whose role was to police content. This authority has been rejected, the Church is now neither an arbiter or popular taste or a creator of popular culture. The result of this is that the Christian narrative has little to no impact or influence on the primary, contemporary form of artistic expression- film and television. The Church is, quite frankly, missing in action. Well-meaning Christians may enter into cinematic storytelling with projects targeted almost exclusively to a Christian market, but these films, some of which are presented with high production values and are financially successful, miss the mark. Why? Because their broader cultural influence is negligible. It seems to me that it is not merely a matter or money, for monetary patronage alone cannot change this situation. The real problem I think (and this is hard to say) is that the depth and profundity of the unique Christian narrative has been positioned not so much as a source of creativity or inspiration, but as ideology. This often expresses itself in an emphasis on moralizing in Christian storytelling rather than an emphasis on the revelatory or the Incarnational. The impression left with viewer when moralizing is central to the narrative is that one is being corrected, rather than inspired; one is being introduced to ideology rather than finding a route of access to the transcendent. Creativity and inspiration produce great art. Ideology produces propaganda. The Christian narrative, densely textured and radiantly humanistic, produced Chartres Cathedral and the Sistine Chapel, some the greatest examples of visual storytelling that humanity has to offer, but the Church has yet to produce great art in the cinematic form and style?! Why is this the case? Christians should not evade responsibility for this discrepancy by directing attention to factors external to the Church as the reason, but should look at ourselves and consider what we have done and failed to do. Do you have a closing question or provocation for readers to think through or carry on the conversation? There will be no great Christian art without sacrifice. My question is this: What sacrifice are you willing to make so that the Church can do more than just conserve its great artistic patrimony, but also to support and utilize the creative potential of humanity to proclaim, represent and teach the Christian narrative- the revelation of God in Christ, a revelation that is ancient and forever new. Father Steve Grunow is a priest of the Archdiocese of Chicago who serves as CEO and Executive Producer for Bishop Barron's Word on Fire Catholic Ministries. He chose the art and architectural locations locations featured in Bishop Barron's award winning documentary "Catholicism: A Journey to the Heart of the Faith". Father Steve has been twice nominated for an Emmy Award and currently resides in Santa Barbara California.